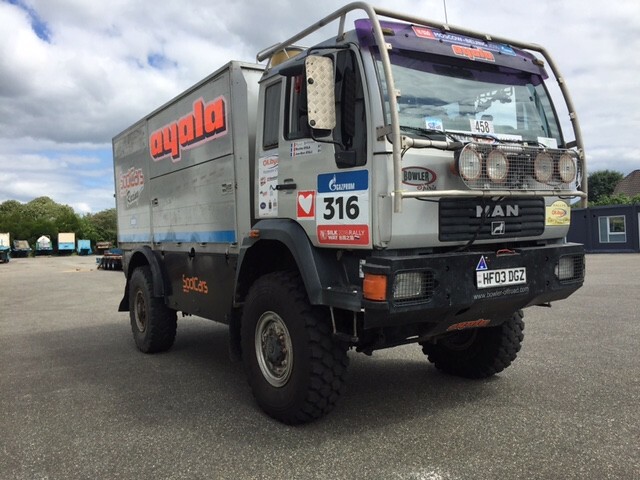 Factory supplied by MAN and built by MAN/Toni Maurer as a Daker T4 race support truck. Huge list of upgrades to chassis/engine/gearbox/cab/diffs etc etc. Been kept in A1 condition by race team, comes with Syegon CTIS and I bought it with 10 cases of spares, incl 6 spare wheels/tyres. Last edited by Rusape on Wed Oct 11, 2017 7:33 pm, edited 1 time in total. well that's a really good start, very nice. It would actually be a shame to convert that into anything other than what it is! Does it sound as good as it look's? Sadly, at only 520hp it is not competitive enough. The modern T4 trucks are now approaching 1200hp !! It will make a great base vehicle as it was built for the very harsh conditions of the Dakar. Very nice! That's a great truck to have ownership of. I did wonder at first if it was the L90 that I was keeping an eye on . Which country did you buy it? Nice truck, what is in the back? Purchased in France, the previous owner just taken delivery of his new 1000hp truck. He hopes it will be more competitive than the sluggish MAN ! Roll cage, special sand fliter housing and air stack, 5 double racked cases of spares, 6 spare wheels and tyres, lighting and workspace.